As I get e-mails on a daily basis asking where to get E21 parts, let's setup a little directory here that might be useful to all of us. Please, no guys that are selling one or two parts every now and then, but preferably businesses that can really be of help at any time and that we have some good experiences with. All suggestions collected in 1st post, please note that 99% of all suppliers ships worldwide these days, and at decent rates. [new] Hardeman Motorsport parts and LSD overhaul - Netherlands - http://www.hardemanmotorsport.nl/ our main sponsor! [new] Classic Capsule (logo's etc) - UK - http://www.classiccapsule.com - website appears to be down? Last edited by Jeroen on Wed Jun 23, 2010 6:07 pm, edited 1 time in total. I’ll add my two cents. Just the two sources. First my local BMW dealer in Manchester. Use them to order parts from. Being a main dealer, prices are what they are, although they have offered me trade deals now and then and saved me money on bumper bolts and washers by offering me a "bumper bolt kit". They're very helpful when ordering and since they don’t charge extra for postage for many of the parts that come from their dealer networks, prices are competitive. Linwar Motors (UK). Based in Southport, I found the guy a little cold, although certainly knows his stuff has a decent amount of parts in stock. Some nice technical tips on their website and they also offering servicing to main dealer spec. 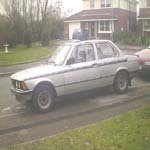 If you're in the BMW car club you get a discount on parts, alternatively there's a guy on e30zone who does parts by post. The forum section is the official bmw parts dept - he is the parts guy for a dealership in the cotswolds. Walloth & Nesch is now officially on the blacklist after many reports (and first hand experience!) on severe quality issues. Alternators breaking down just after 13 months (no warranty), bad chrome quality, rubber parts of inferior quality like guibo flex discs causing all sorts of problems and time consuming repairs, brackets that have wrong holes, indicator housings breaking, windscreen seals not fitting properly, bad clutch bearings causing trouble within a few thousand km's, leaking water pumps, the list goes on and on. So from this point we cannot recommend any parts from them anymore, there's too much risk involved and too many known issues already. E21 urethane bushings made by an e21 owner/enthusiast. They are also available in many colors. I get parts for my Malaysian based 323I from a dealer called Autohaus Kaltenbach in Bergisch Gladbach in Germany.I collect the parts when I am in Germany, or alternatively my fiancee brings them with her on her visits to Malaysia. I must say that I am very pleased with the service from this dealership. The service guys at this dealership take great interest in the fact that someone in Malaysia is using an E21 as a daily runner. One example of their good service: I ordered a refurbished alternator yesterday and it arrived from BMW Classic in Munich today. Interesting German business! They don't have a whole lot, but they do have some real rare NOS items, for E21 and other models as well! I noticed that another worthy source was not in here yet! German Michael Cahsel is an 02 specialist but has many rare NOS items including E21 just like the business I just reported in the post above. On top of that they also have rare performance and motorsport stuff. Worth to browse around their Spares and Curiosities sections and you can also have their parts list for other models emailed. I'll try to post that one here asap. Edit: pls find below the link to Cahsel's non-02 parts list. I just got it emailed from them, but it is dated 2011. Several parts will not be available anymore (for example I tried the E21 kidney grill or Niere in German, they are nla). Not planning to maintain an official blacklist but we gathered some personal experiences with Meyle parts and bad experiences should be shared as well. Can only say we haven't seen worse in ages. Especially rubber parts like suspension bushings but also control arms and ball joints have a life span that does not match expectations, by far! So nice stories about good 'HD' quality, oem quality at fair rates and more in their communications, but we are not impressed. Here some places to find upholstery for our cars. I was struggling to find front discs for my 323i for a while, lots of places listed e30 vented discs as being suitable which of course they are not. Eventually I went to carparts4less, they are not a stock item but after some emailing I received a pair of Pagid discs, delivered for under £48. Strangely Eurocarparts (who are the same company) told me they couldn't order them and Pagid din't supply them any more, I think someone was lying!